It will take more than three years to sell all the properties having loans that are seriously delinquent, in foreclosure or under REO, says a recent report. This shadow inventory, coupled with a lethargic buying crowd is affecting sellers -- from owners of low-end homes to luxury mansions -- who can't move their properties at prices they would like, even if they are not facing foreclosure. 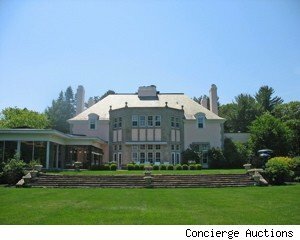 One of those affected is Heidi Steiger, an investment banker who wants to sell her luxurious 12,000-square-foot home (pictured left), in the lakeside town of Tuxedo Park, N.Y., so that she can move to Florida, now that she no longer has children at home. But after several price reductions, the 1909 stone-and-stucco Georgian on 19 acres, known as Top Ridge, still hasn't sold. The data in the Nov. 1 report released by Fitch Ratings reveals that, based on recent liquidation trends, it will take more than 40 months to clear existing distressed inventory. In judicial foreclosure states, such as Florida, it is expected to take even longer than the national average. And so long as distressed homes are on the market, that means challenges for people like Steiger, who aren't underwater or facing foreclosure, but simply want to sell at a decent price. "The shadow inventory of luxury real estate is significant and it is significant because many individuals who own these luxury homes have been in denial about how much prices have fallen, especially in second home markets," says George Graham, CEO of Concierge Auctions, a preferred auction provider to Sotheby's International Realty that is now marketing Steiger's home. "We feel that the correction of luxury property is taking longer," Graham says, "and will continue to take longer than regular homes because the luxury market started its price correction later." For those facing foreclosure, the number of months between the date of a borrower's last payment and the date of liquidation has steadily increased over the past several years, and is now at more than 18 months on average. Fitch says that is the highest figure on record. It means there are more homes lurking in the shadows, waiting to come on the market. And when they do, prices are likely to drop even further as there will be more supply than demand. working off the increased foreclosures that are building up. "Prices will continue to fall for at least another 12 months," he told HousingWatch. "I expect to see prices on average about 10 percent lower than they are now within 12 months.... Now that the tax credit has expired, things have really slowed down. "If the government would re-institute the tax credit for the next 5 years, and force banks to work harder and faster on short sales," Lamacchia says, "prices would bottom-out sooner." Whether or not additional tax credits could help is debatable, but as far as Fitch is concerned, loan modifications' effectiveness at reducing liquidations has not lived up to hopes. The majority of modified loans have re-defaulted after one year, and the number of remaining borrowers eligible for a loan modification appears to be declining, as new loan modification activity has declined from its peak in 2009. Although interest rates are near historic lows and affordability has improved, fewer potential buyers can qualify for new loans due to heightened credit standards, Fitch says. Additionally, high unemployment, weak consumer confidence and uncertainty about the future of home prices have prevented some potential buyers from entering the market. "Fitch is currently assuming approximately a further 10 percent home-price decline nationally, with the majority of the adjustment occurring by the end of 2012. However, the timing of the adjustment will be affected by the timing of the distressed inventory resolution," the agency said in its report. Graham told HousingWatch: "Compared to someone who owns a $175,000 house, people of means who own luxury real estate have the capacity to carry this real estate for a long time in the hopes that someone will buy it at the price they want before they say, 'I can't carry this anymore.' "
And that's how Steiger feels. After several price reductions, she's ready to just unload her property at auction through Concierge, which says it sells homes within 60 days at the price the market says is fair. "Many uncertainties exist when selling luxury homes through traditional brokerage methods today," says Steiger, "and I have arrived at the realization that I would rather obtain market value now than wait an unknown period of time for an offer." Originally listed for $9.8 million, Steiger's seven-bedroom, six-bath estate (interior pictures above) will be auctioned Nov. 19 without reserve to the highest bidder, regardless of price. Its amenities include a marble-floored rotunda entry with domed, hand-painted ceiling, formal grand salon, formal dining room, expansive master suite, chef's kitchen with butler pantry, exercise and media rooms, billiards area, indoor swimming pool and a tea house. "We are telling our clients and sellers that there is no reason to wait to sell your home because there is not going to be a recovery anytime soon in luxury," Graham told HousingWatch. "The availability for mortgage financing for larger homes has shrunk considerably." Get property tax help from our experts.